This delicious gluten-free gnocchi recipe by Victoria Glass is wonderfully colourful and surprisingly easy, using a mixture of golden beetroot and potatoes. To finish the gnocchi, Victoria fries the dumplings in butter and oil, resulting in a crisp, golden outside and soft, pillowy centre. Not everyone is lucky enough to have a garden to dine in al fresco. If you are like me and live in a flat with no outdoor space, the summer can see you wasting hours perusing your dream houses with gardens on Zoopla, while fanning your hot face with brochures from the local estate agent. Forget moving house – who needs all that packing and unpacking in all this heat? Instead, why not bring a little sunshine to your table with a summery weekend lunch with friends. You can always walk it off in the local park afterwards to make the most of the hot weather. 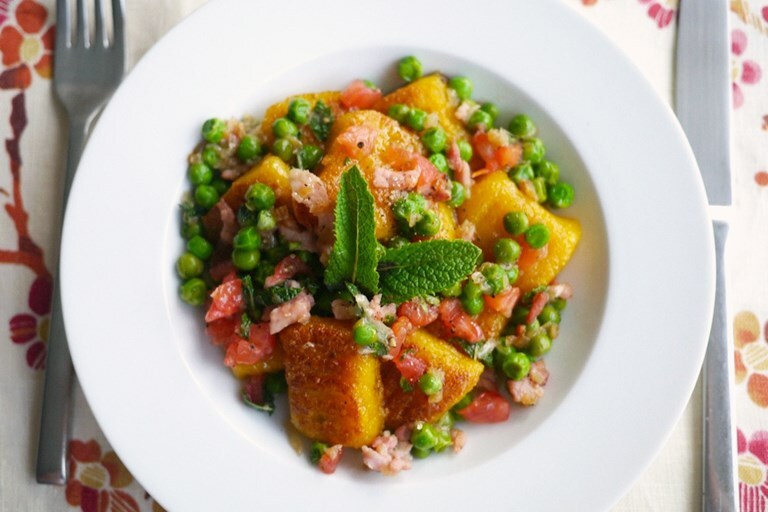 Any cooking is hot work in this weather, so instead of spending hours at the stove in the midday sun, this recipe can be made the night before, once the weather cools down a bit, and then finished in 20 minutes with a glass of cold Prosecco in hand. People assume that gnocchi is labour intensive, but it’s actually fairly simple. The most important thing with gnocchi, is to get rid of as much moisture as possible. Most recipes tell you to boil the potatoes with their skins on, but I prefer to bake them. Not only does this get rid of more moisture, but you can also leave them in the oven unattended, while you skip off to do other things. Rolling and cutting the beetroot and potato dough is the only fiddly part of the whole process, but I actually find it quite satisfying. Once the dumplings are made, the rest is all about minimal chopping for maximum summery flavours.